Lou Pimentel: New watercolor, "Swept"
This weeks topic on Illustration Friday is SWEPT, which is what I do when I find a beetle in my place. Sweep those lil buggers out with a broom lol. 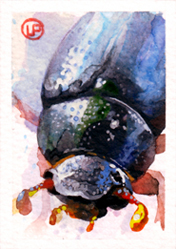 This piece is tiny, 2.5" x 1.75" watercolor on watercolor paper. Oh, I'm right there with you! Wonderfully realistic! Nice! I like the bee on your banner too. Beautiful color pallet for such an unattractive subject :-P Beatifully rendered.